A coupe version of BMW's latest 7-series sedan (shown) could go on sale as soon as 2019. 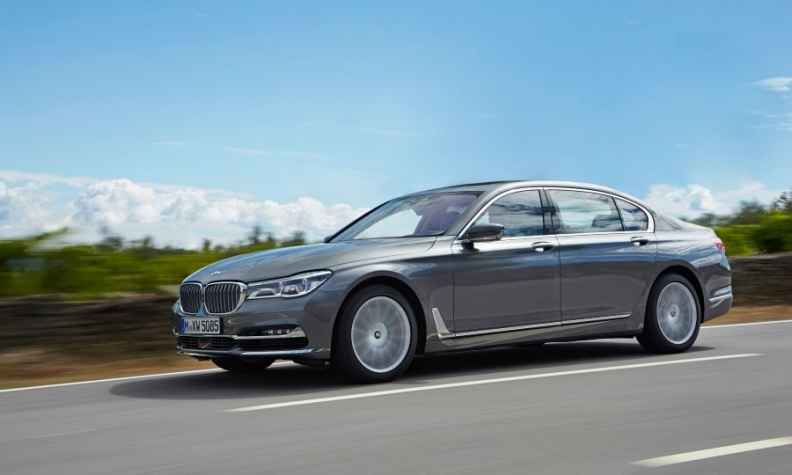 MUNICH -- Less than a year after BMW introduced the latest version of its flagship 7 series, a roomy sedan that can park itself via remote control, the automaker has quietly conceded that it landed with a thud. Even so, the car that begins at 82,600 euros is so vital to the company’s bottom line that BMW is doubling down with a coupe variant. A sporty two-door version of the 7 series is in the works for as soon as 2019, according to a person familiar with BMW's plan, who asked not to be named because the plans aren't public. The luxury coupe is the first of several new versions BMW is considering to give sales of its top model a lift. Mercedes-Benz used a similar strategy to cement the position of its S class as the world's best-selling top-of-the-line sedan. Just four years ago, the 7 series was at parity with its Mercedes rival. Today, sales have fallen 40 percent below those of the S class and are only slightly ahead of Tesla 's Model S.
Next year will be even tougher for the 7 series, with Audi poised to introduce a self-driving version of its A8 flagship. BMW's aim with new variants is to pull even with the leader again, according to the person familiar with its plans. Success with the 7 series is important both for BMW Group's image and its bottom line. After a decade of ruling the world of luxury cars by filling nearly every market niche from two-seat roadsters to SUVs, BMW is on the cusp of losing its lead this year. A refreshed look and new crop of SUVs helped Mercedes outsell BMW by more than 30,000 cars this year through July. The fortunes of a company's most expensive car tend to reflect the company as a whole, with the halo -- or shadow -- of the model extending across the entire brand. High-end sedans are more lucrative than smaller vehicles, making them a crucial source of cash to invest in new technology. And they're typically the place where automakers introduce new features, providing a proving ground for ideas that filter down into less expensive models. "The 7 series hasn't managed the same 'aha' effect as the new S class, which is what Audi will be going for too" with its new A8, said Juergen Pieper, an analyst at Bankhaus Metzler in Frankfurt. "It's lacking that special something." Internally, BMW has blamed the 7 series’ slow sales on too few technological advances and boring design, a person familiar with the plans said. Features such as gesture control, which uses up to five different hand signals for functions like radio volume, haven't ignited the same customer interest as the likes of Tesla's Autopilot. And the 7 series doesn't offer the variants available in the S class, which comes in six different versions, including a convertible and an ultraluxury model called the Maybach. BMW will also bring out a Maybach competitor in the range above 150,000 euros ($170,000), development chief Klaus Froehlich told Automotive News Europe this year. That would be roughly the same price category as the Maybach. In the meantime, a plug-in hybrid and the first high-performance version of the current 7-series sedan will contribute to sales, BMW says. Thanks to last year's revamp, deliveries of the car more than doubled in July to 5,025 vehicles, and a company representative said it expects "this positive trend to continue over the course of 2016." The wild card will be Audi's A8, which will have self-driving systems more advanced than those of either the 7 series or the S class. Drivers will be able to let the car take over completely in highway traffic jams at speeds of up to 60 kilometers (37 miles) an hour, according to the company. Unlike Tesla's Model S and this year's Mercedes E class, Audi's car won't then require a hand on the wheel. "The new A8 will be quite a meaningful departure from the current model," said Stuart Pearson, an analyst at Exane BNP Paribas in London. "You would expect to see 7-series sales start to decline again when the A8 comes out." The fat return on sales makes clear why carmakers are fighting for buyers in this segment. Mercedes's profit margin on the S class was 14 percent last year, versus 9.5 percent across the Daimler unit's auto division, Evercore ISI estimates. BMW saw an estimated 11 percent return on the 7 series, exceeding the 9.2 percent across its automotive unit last year. Growing discounts from U.S. dealers highlight the difficulties BMW has had in luring customers, said Commerzbank analyst Sascha Gommel, citing researcher Autodata. Price incentives for the 7 series climbed twice as much as those for the S class this year and hit $13,053 per vehicle last month. "The 7 series will be highly profitable and have decent sales volumes, but it'll never really measure up to the S class," Gommel said. "The two used to compete head to head, but there's no chance anymore."